Summary and Definition: The Cowlitz tribe were amongst the Native American Indians who changed the shape of their heads to a flat, elongated shape and nicknamed 'Flatheads' by the Europeans. The Salish speaking Cowlitz tribe were part of the Chinook nation and were amongst the Native Indians encountered by the Lewis and Clark expedition in 1805, who referred to them as Skillutes. 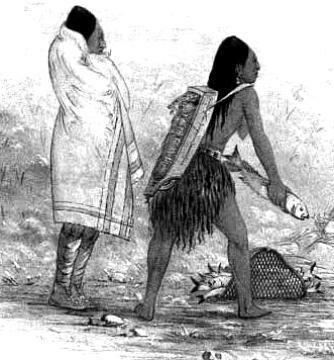 The Cowlitz were fishers who lived along the Columbia River. The Cowlitz tribe were a Native American Indian people, members of the Chinook nation, who controlled areas on the western part of the Columbia river. The Cowlitz tribe belonged to the coastal division of the Salishan linguistic family, yet shared a similar lifestyle to the the inland tribes. The Cowlitz people were organized into settlements that consisted of plankhouses made from the abundant cedar trees. The Cowlitz tribe were many of the Northwest Native Indians who used tattoos to decorate their skins and re-shaped their heads according to the customs of their people. This drastic change in their appearance and their elongated, flat heads led to the nickname of 'Flatheads'. Refer to the Flathead article to learn more about their lifestyle and method of creating the elongated and flat shape of their heads. As can be seen by the following map the people of the Cowlitz tribe lived in close proximity to many other Native Indian tribes. The Cowlitz tribe consists of two distinct groups: the Upper Cowlitz (Taidnapam) and the Lower Cowlitz (Kwalhiokwa). The Lower Cowlitz occupied 30 villages along the Cowlitz River from modern day Mossyrock southward to within a mile of the Columbia River. There lifestyle was similar with their neighbors and details of the types of clothes they wore, their religion, the food they ate, their plankhouses and their canoes. For details of their way of life refer to the Chinook Tribe. Mount Coffin was a headland in what is now Longview, Cowlitz County, Washington. Coffin Mountain was so called because it was the burial site of the Cowlitz (Skillute) tribe. The Cowlitz burial site consisted of a great number of canoes that contained the bodies of Native Indians, each being carefully wrapped in blankets, and supplied with many of his personal effects in the form of jewelry, clothes, blankets, baskets, weapons and tools. The Cowlitz tribe were great fishers, and believed that the salmon were a divine gift from the wolf-spirit Talapus. The wolf-spirit Talapus was believed to have created the salmon to save the Cowlitz from extinction at a legendary time of near disaster. The Cowlitz tribe celebrated the 'First Salmon feast' which honored the salmon. The name Cowlitz means "seeker" in a spiritual sense and reflects their tradition of undertaking Vision Quests. Where did the Cowlitz tribe live? The Cowlitz are people of the Northwest Coast Native American cultural group, often referred to as Flatheads. The location of their tribal homelands were in the interior southwest of what is now the State of Washington. The geography of the region in which they lived dictated the lifestyle and culture of the tribe. They lived in the Pacific Northwest coastal region in the state of Washington. The Lewis and Clark expedition made contact with the Cowlitz tribe in 1806. The following article, Journals of Lewis and Clark: Native Indians, provides details of their encounters with the Native American Indians who inhabited the region. On April 20th, 1806, Meriwether Lewis wrote of the Skillutes (Cowlitz) "...they are poor, dirty, proud, haughty, inhospitable, parsimonious and faithless in every respect, nothing but our numbers I believe prevents their attempting to murder us at this moment..."
Who were the most famous leaders and chiefs of the Cowlitz tribe? The most famous leaders and chiefs of the tribe included Chief Atwin Stockam, Chief Cheholtz, Chief Kiscox and Chief Schanewa. Cowlitz History: What happened to the Cowlitz tribe? A terrible epidemic, known as 'Gray Fever' (thought to be Asian Flu or smallpox) wiped out much of the Cowlitz population during 1829-30, leaving about 500 people. The population increased with time and today most of the 1,400 remaining Cowlitz live near their ancestral homelands. The Cowlitz Indian Tribe were officially recognized by the United States federal government on February 14, 2000, and their acknowledgement was reaffirmed in 2002.